After creating a form, you might want to modify its appearance. Formatting your forms can help make your database look consistent and professional. Some formatting changes can even make your forms easier to use. 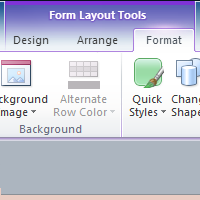 With Access 2010's formatting tools, you can customize your forms to look exactly the way you want. In this lesson, you will learn how to add command buttons, modify form layouts, add logos and other images, in addition to changing form colors and fonts.